These three words summed up all the emotions the Mediacorp Suria team felt when the referee blew the final whistle to signal the end of a pulsating final and subsequently this year’s edition of the Piala Dollah Kassim tournament, played at the Woodlands Stadium this past Sunday evening. This victory was made sweeter because as compared to last year’s team which had several friendly matches to play prior to last year’s tournament, the whole team (those retained from last year as well as the newbies this year) only came together a week before the tournament began, whereas some teams had already begun training before Ramadhan came along. We were short of match fitness, cohesiveness and understanding on the pitch and this was evident in our two friendly matches prior to the tournament kick-off, which we drew and lost. More evidently, when we had a three-week break between the last qualifying game and the Final last week, we could not get any friendly matches to play to sharpen up our game. Miracle or not, perhaps it was our destiny to win this year. Whatever we lacked on the pitch, we made up for it with relentless self-belief, team spirit, a collective sense of brotherhood where there is no particular star player in the team (even though the team was sprinkling with local celebrities) and most importantly we had a mental resolve and never-say-die attitude which were hallmarks that made us this year’s champions. Five times we conceded throughout the course of this year’s tournament (three in the first game, one each in the third and Final games), but we came back to equalise and salvage our matches, and winning the Final in the process. Victory was all the more sweet because we had no S-League nor ex-international players playing for our team, because this team respects the essence and sanctity of this tournament, which is a charity event first and foremost. Stepping foot at Woodlands Stadium brought a sense of nostalgia to myself and perhaps my family members who came to watch the match as well. This was the very venue that most of us last saw Allahyarham Uncle Dollah in action for a charity game called “Charity Football Fiesta“, between local celebrities and ex-international footballers back in February 2009. I’m sure my team-mates Taufiq Salleh and captain Syed Azmir, would remember that game as they were in the same team as Uncle Dollah. Before the match began and our team was seen huddling together for quite some time, prompting the emcees to say we were saying our prayers for good luck, they were actually half right. We did say our prayers but not for good luck. In fact, I was extremely touched by Syed Azmir‘s kind gesture to lead the team in reciting Surah Al-Fatehah for the soul of Allahyarham Uncle Dollah. It might be a small and trivial gesture to some, but as Uncle Dollah‘s nephew and observing from a neutral perspective, it left an indelible impression on me that my team captain is a man of substance and led by example. The game itself was a like a game of chess in the first half with both sides probing and calculative with every move made. Conditions did not help by the downpour before the game, which rendered the pitch muddy on most parts. The game had to be stopped halfway in the first half as the heavy downpour and lightning prevented us from continuing, which of course delayed the match further. The tempo only picked up in the second half when PERKAMUS scored their first goal within ten minutes after the start. I was beaten by an extremely good goal by Muhammad Farouq, even though I had dived full stretch and gotten my hands to the ball. Maybe ten years ago when I was younger, slimmer and more agile, I could have prevented it from going in. We could have easily been deflated but again as this tournament had witnessed, we came back strongly to equalise through Raja Razie and scoring the winner through Syed Azmir, capitalising on individual errors made by our strong opponents who had been controlling much of the game, while we were contented to sit back and soaked as much as we could from their forays into our area, before counter-attacking them. Personally I am thankful that we won because it now gives me the opportunity to speak my mind about the tournament from a winning position. It is something I have been keeping inside for one whole year since the last tournament and one which I said in my earlier entries that I would voice out on a later date. The time has finally come to speak my mind. If I were to begin my rant from a losing perspective, it would be easy to condemn me as being sour grapes. 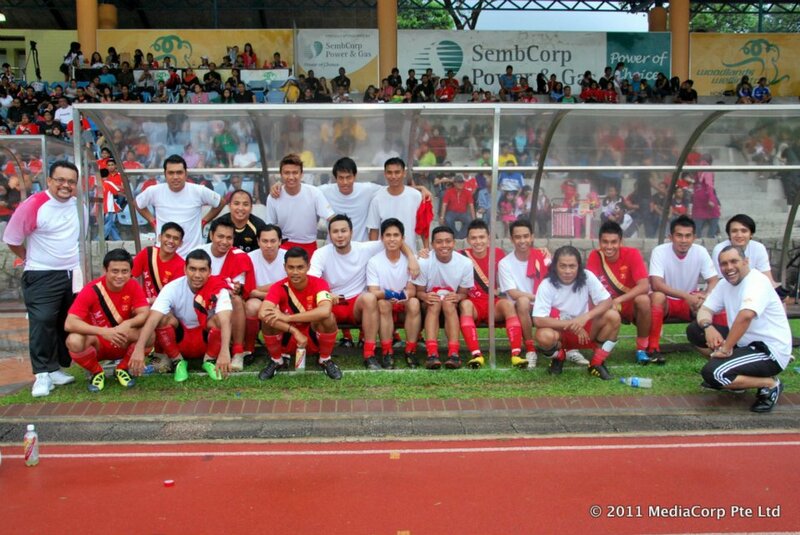 While I am eternally thankful to the organiser of this tournament, PERKAMUS, for organising this charity football event by honouring my late uncle, as well as their noble efforts to bring together the media and entertainment industry in Singapore for a good cause, certain things need to be re-evaluated if they were to organise this event again in the coming years ahead. Just because Mediacorp Suria has won, does not mean certain problems and unhappiness felt by the other teams can be swept under the carpet, be forgotten and repeated all over again the following year. Number one on the agenda is the interpretation of the tournament rules. There needs to be a clear indicator and spelling out to what can be done and what cannot be done to avoid confusion and discontent amongst teams, players and managements alike. The organiser’s decision to field an S-League player who has represented Gombak United FC, seemed to be a contentious debate throughtout the course of the tournament. 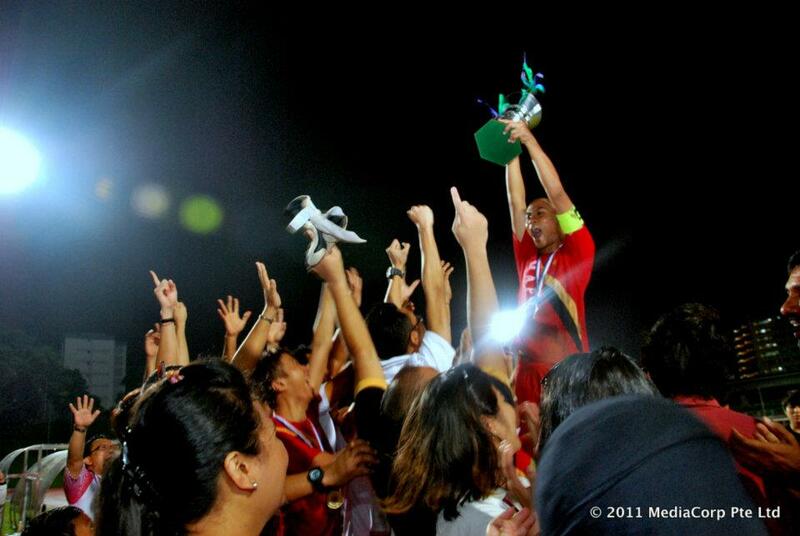 When queried by the other teams, the organiser said this player’s contract with his club ended on 3 October 2011, but his Facebook profile currently states that he is a part-time footballer with Gombak United FC. Whether his contract ended then or whether he is a part-time footballer, the fact remains that he is still affiliated to a professionally-run club playing in Singapore‘s premier division and no professional club is going to take a player who does not meet their basic prerequisites, qualities that set a professional player apart from those playing amateur or social football. Between last year’s tournament and this year’s, he had played professional football for an S-League team, so that makes him a professional player, part-time or not. It certainly left a sour taste after last year’s Final which we lost, knowing we were beaten by the presence of a professional league player who had scored twice that night. 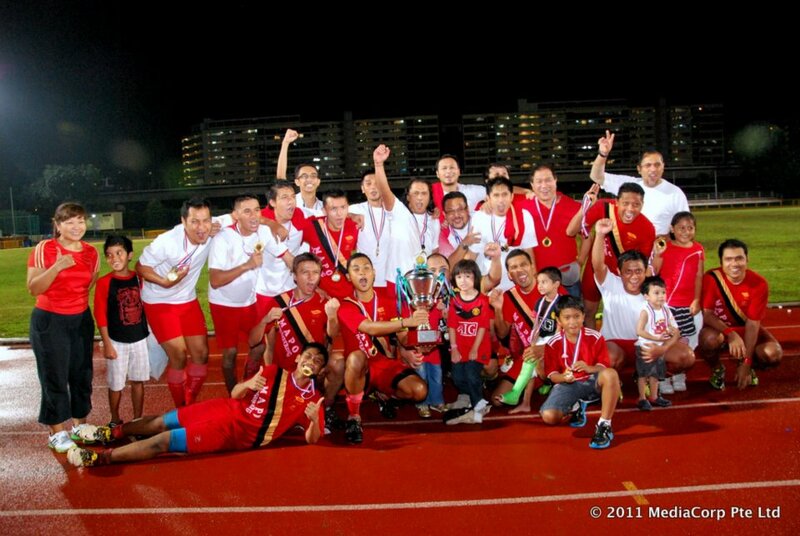 From my understanding, tournament rules stated that no player is to play for any club team in Singapore. This is a CHARITY tournament afterall, a team does not need to field professional standard players nor ex-internationals in their team to add colour to the competition nor to aid their competitive cause. There are already enough local celebrities and media personalities to make up the tournament, with invited players of amateur or social footballing background adding on to the numbers. Even more surprising were the mysterious appearances of one or two other players, who from my own personal observations, suddenly appeared in the Final but not the qualifying rounds. I want to go on record and say I am not implying nor accusing the organiser of cheating, never have and never intended to make it that way, even if I sound as though I am doing so. There will always be loopholes in the rules which any team can take advantage of, and they did so because the player’s contract with his club was apparently up. However, in the interest of competitive fairness and spirit of sportsmanship, I feel and I’m sure many others felt that it is just not right, because you tend to wonder where is the level playing field when you pit professional standard players against amateurs and social footballers like us in a charity tournament??? You can argue that it is just one player and that one player does not make a team, but if this player is your team’s star and eventual tournament’s top goalscorer, it says a hell lot about his technical abilities on the pitch. Hence why the rules need to be spelt out clearly to avoid unhappiness and misunderstandings. Our team could have taken a leaf out of the organiser’s book and invited the likes of Baihakki Khaizan (who is currently without a club) or Aide Iskandar (ex-national team captain who has had his fair share of acting stint on television) to turn out for us, but we chose not to as we respect the tournament as it is and do not see the need to make the other teams unhappy. The other teams had protested and rightly so. Personally for myself being a part of Allahyarham Uncle Dollah‘s family, I worried for the intrinsic value of this tournament as it was used in his name. The family had kindly given their blessings for this tournament to be held, it would be nice if they were also informed of the rules governing it and not just a summary of the tournament’s progress. In future if this tournament is to be held, contentious and ambiguous issues like these need to be discussed and agreed upon by all teams, counter-checked by independent sources for transparency sake and approved jointly by the organiser and the family. All teams should also stick to the original squad of 22 that they had registered at the start of the tournament. Any changes in terms of personnel, need to be informed to all teams so that they understand why certain players suddenly appear towards the end of the tournament, when at the start they were not seen. I can understand that perhaps some players are only available on certain dates, but basic courtesy on informing still needs to be observed as a mark of respect to all teams, even if this is a charity tournament. You cannot have players appearing for one or two games disappear and have other stop-gap replacements without informing the other teams, especially if the replacements are players considered more talented and skillful. This creates resentment as to why most teams adhere to the rules while some are able to capitalise on loopholes. We would have gladly lost the tournament with pride if teams did not field players of high calibre and stature, because we know deep in our hearts, we’ve done our bit for charity and knowing we lost to players of the same amateur standard as us. Anyway our community is small, one way or another we know each other and the other person’s footballing background. Hence the need for transparency. Another peeve that I need to bring up were the emcees of the event. We know that one of them is part of the organising team, but that should not make some of their presentation extremely bias towards their own team. A standard complaint I heard from people who were at the stadium, was that they were simply annoying and I could not agree more. The players were distracted somewhat by the irrelevant commentary by the sidelines, notably in the first half. In future, it would be best to engage emcees who know what the game is all about, who know how to differentiate between a free-kick and a penalty kick, who do not incite the opposing team by saying their players were feigning injury and acting when it was all clear to see that the injured player had his legs taken away and the offending player yellow-carded in the process. Oh not to mention, speaking in good English as well, sans grammatical errors. As an emcee, one needs to be professional, non-partisan, have some knowledge on what they are presenting and of course fluent in the language that they are speaking in. What irked me the most was when the emcees were interviewing the Youth Olympic Team‘s football players and voicing their disapproval towards the Sports Foreign Talent Scheme. We all have our own sets of agreements or disagreements on the matter and the topic is extremely subjective in my opinion, but when you choose to disagree vehemently, do not speak in your mother tongue when before that, you had been speaking in English throughout. It is not fair to the non-Malay speaking spectators as they do not understand what was being said and it felt as though it was being made a personal conversation to spite them. Certain ethics need to be observed when presenting, you cannot just speak your mind just because the microphone is in your hands. I was just glad when informed after the game, that my young daughter had the presence of mind to march up to one of them and told them to hush and respect the time as it was Maghrib. At least the second half was a bit quieter and the players on both sides lifted their game as they could concentrate better. Other than the three grievances I aired, I still believe and share the sentiment that PERKAMUS did a stellar job in organising this tournament once again, with the public more aware of its existence and with the increase in the number of kind sponsors supporting the event. This is also evident in the number of personalities who have come forward to be a part of this tournament. To get Woodlands Stadium to fill two-thirds of its grandstand capacity on a day it rained, was an achievement of sorts and one they could be proud of. Hopefully their noble efforts in getting proceeds for Jamiyah’s Darul Ma’wa Children’s Home will be rewarded in kind by Allah Almighty, as well as those who had come forward to support the event in cash and kind. For the record, Berita Harian beat Dramatis 9-1 in the third and fourth-placed match played in good-hearted fashion and humour enjoyed by everyone watching. Personally it was a satisfying experience for me having gone through the heartache and disappointment of losing last year’s Final, having clawed our way back to 2-2 after being 0-2 down at the break, and losing with four minutes to spare. For amateurs like us who can only dream of playing in front of a packed audience, this was the closest we could get to experiencing playing in such a setting. Having players you respected when you were young and watched them play in the Malaysia Cup, watching you in the stands like Hasnim Haron and Syed Faruk Alkaff amongst others, was simply inspirational and lifted my confidence somewhat. I was just fortunate that aside from the goal I conceded, everything went my way because I am often prone to the odd gaffe on the pitch. It helped that the whole team worked hard for each other and continued encouraging and cajoling one another when our opponents led the game. To the whole Mediacorp Suria team – Syed Azmir (captain), Mohd Fazlan, Miur Rafik, Ikhsan, Mohd Idris, Kassim Jamid, Abdul Mutalib, Raja Razie, Idros Jamid, Rafaat Hamzah, Khairul Ruzaini, Razif Ariff, Shahril Kahar, Shahril Wahid, Fadhlur Rahman, Muhd Dzar, Taufiq Salleh, Effandy Idris, Firdaus Salleh, Aidil Jufri and Fauzie Laily – It was an extreme honour to be on the pitch with you guys as we finally brought the trophy home for the very first time. We might have only played together for six games in total (including our two friendly games), but the spirit and camaraderie we forged was something I would remember and treasure for a long time to come. To manager Ishak Jamid, thank you for inviting me to keep goal for the team and representing my family in the process. To the supporters, especially our family members, who had shouted themselves hoarse last Sunday, this win is dedicated to each and everyone of you. Enjoy the video highlights of the Final match!!! hi, is there any videos of berita harian game in the final? highlights and gameplay. if yes pls send link to my email. thanks!